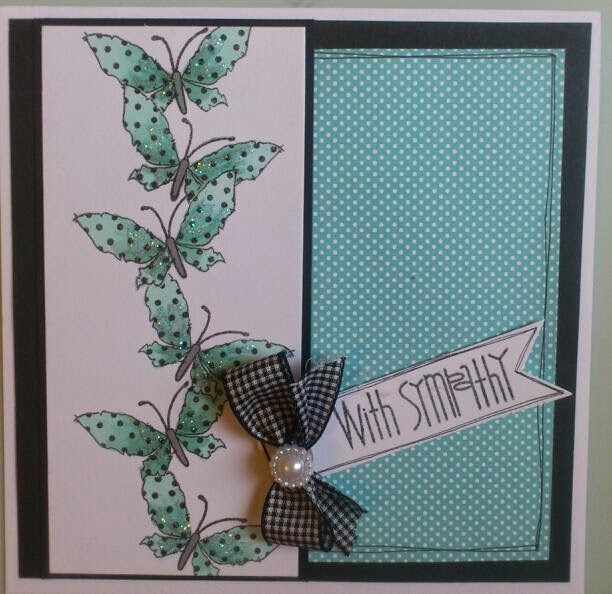 After a bit blog hopping today, I found a challenge blog called "craft your passion" and their challenge is "up in the air/things that can fly................so I sat this afternoon creating a few cards, this one features a spotty butterfly stamp by Tatty Twinkles which I over stamped, combined it with a piece of spotty paper from Simple Stories "snap vibe colour" and a Sentiment from Paper Smoochies.....love how it came together added a bit ribbon and some stickles. 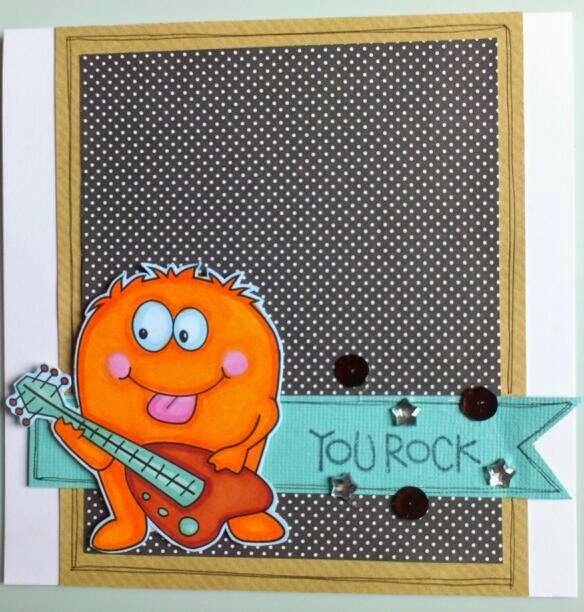 Heres today's card featuring Music Monsters from Digi Stamp Boutique.....been playing with these images lately. 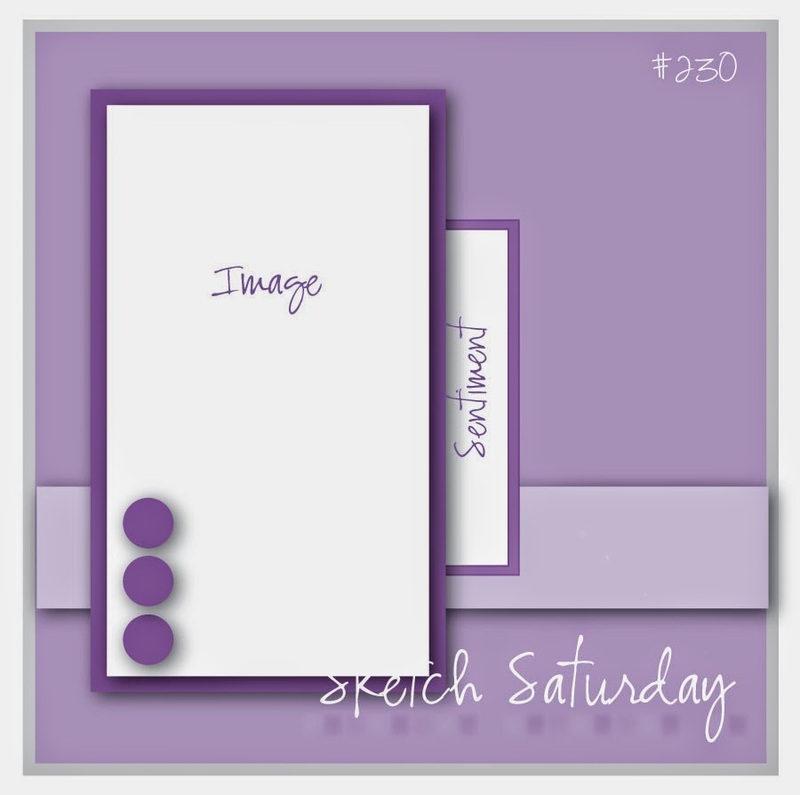 I've use the latest sketch designed by the talented Jen, from the weeks Sketch Saturday. I used Promarkers to colour image and scrap papers from my scrap box (think the spotty paper is from Doodlebug 6x6 pad), sentiment is from Paper Smooches, also added a few star bling and a few sequins to add a bit of interest. 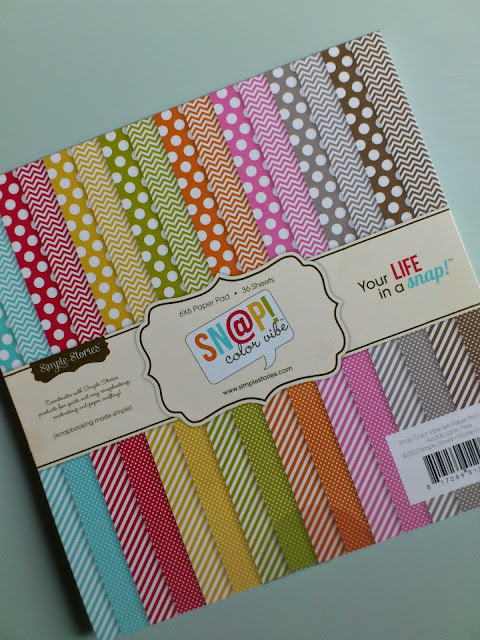 I'm setting myself a little challenge to see how many cards I can make with The Simple Stories 6x6 pad "snap colour vibe" contains 36 papers in 8 different colours, with 4 designs.......keep you eye open for more posts featuring this pad. 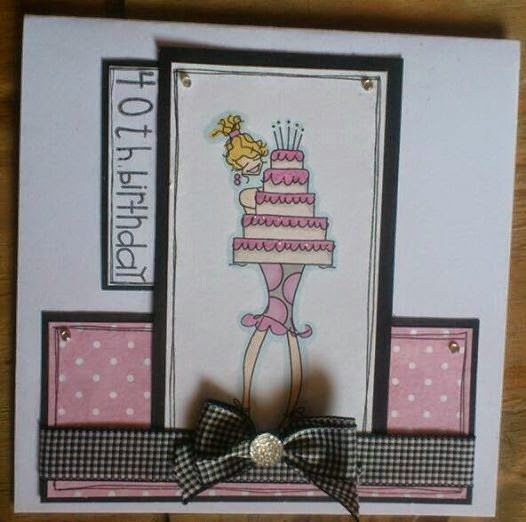 Thought I'd share a card which I made for my cousin's birthday, featuring the gorgeous Wryn, love this girl. Lately Ive been colouring up my box of unused digi's......as my printer is broken, so cant print anything new. So set myself a challenge to use them up. The baxkgroud is made up of strips of scrap papers from my stash, teamed up with Wryn coloured with Promarkers, favourite gingham ribbon, a Martha Stewart punched butterfly and a sentiment (not sure where thats from) also added some 3d paint to background papers and a bit of sparkle with some stickles. I've been very creative this weekend, and got quite a few cards made, its helped that the weather has been wet and miserable here in the North East..........roll on the summer. For todays card I've used the gorgeous Wryn from Tiddly Inks, also my favourite 6x6 pad from Doodlebug, the sentiment is a stamp from Stamps Away and the butterflies are a Martha Stewart punch which I've had for ages, this a great punch and has been well used. Well other news my diet is back on track, I'm doing a 21 day Slim into Summer......its involves a fitness plan with a clean healthy eating. I stayed the same weight after Easter, so still have 3lb to go until I get to my goal. I felt really good last weekend when I go dress to go out. 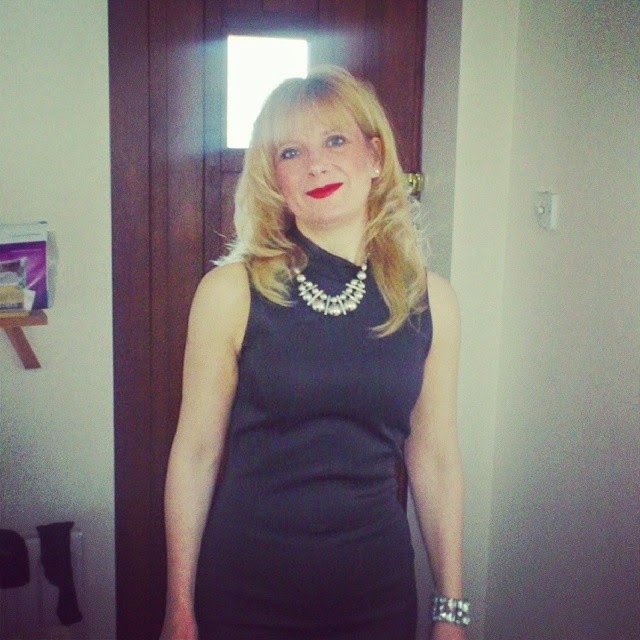 I got a size 10 dress which is 3 dress sizes small than when I first started my diet. 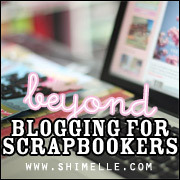 Today I've felt creative, the first time in a little while, so when I saw this weeks sketch.....I thought scraps. So I started with my doodlebug 6x6 pad, Which Ive been using quite a bit lately. Next.... I have a box of printed off digital images, so routed around and found this image, its an old one, I dont where its from think its one of the first ones I bought. 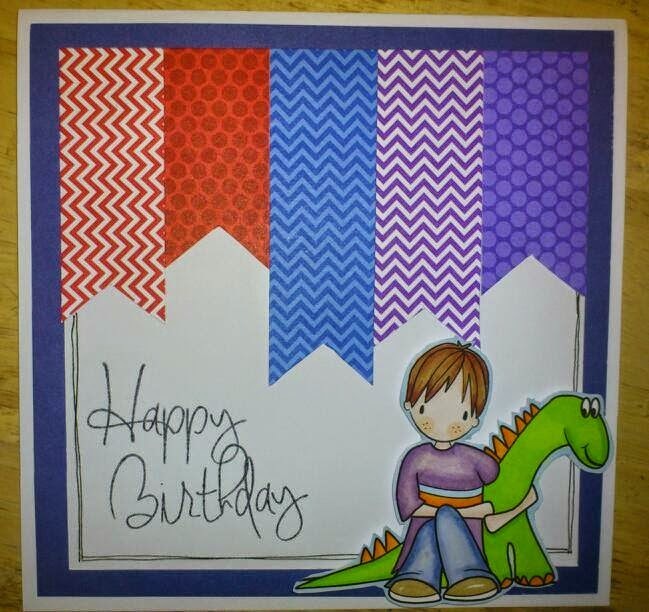 I also used a new birthday stamp from "stamps away". I may add an age at some point. Its a lovely sunny day here in the North East of England, lets hope it continues to the Easter weekend, This week is always a busy kind of week at work. So thought I'd pop on and share the card for this weeks Saturday Sketch. I'm right back into creating at the moment and the sketches are so inspiring along with the samples done by design team. 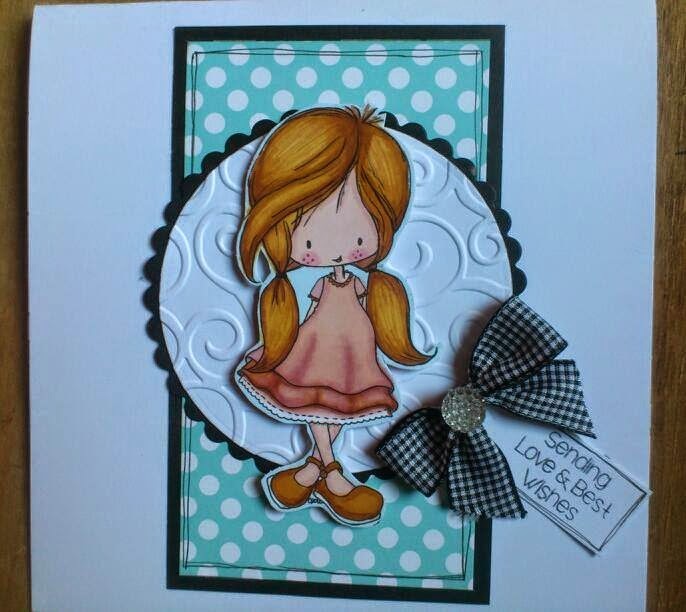 Todays card features the gorgeous Wryn, shes sat on my desk coloured for a couple of weeeks. 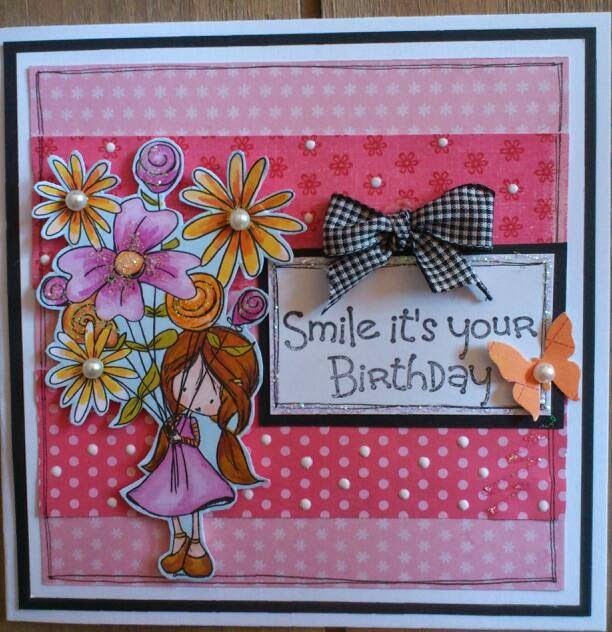 I've kept it quite simple this week, added some die cuts and spotty paper from doodlebug (love this 6x6 pad, must buy more soon, love bright and cheerful colours) added a bit gingham ribbon from stash, can you tell I'm loving this ribbon its so versatile sees to fit any card. 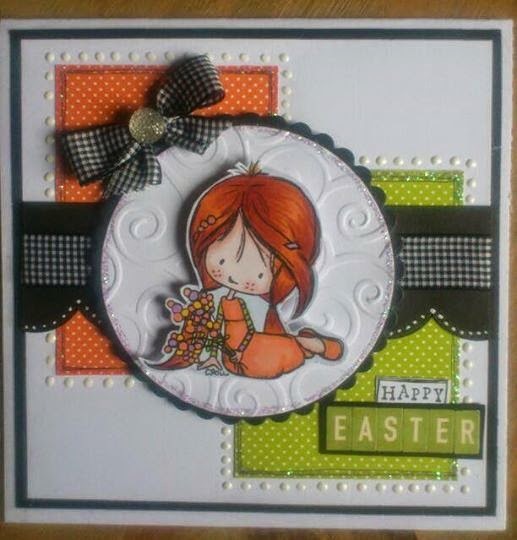 Hopefully I'll be back before the Easter break........if I can sneak in a bit crafting if not I'm sure I can find a card from the pile of new designs I have on my desk. Todays card features Wryn from Tiddly inks, so I've entered it for the celebrate spring challenge over on their blog, find it here. Also combined it with this weeks deconstructed sketch over on Jens blog. I've used papers for a doodlebug 6x6 from Crafty mojo, love this pad papers are so me, love the bright colour palette, actually might have to purchase more before they sell out, combined it with bits n pieces from stash (I'm really trying not to buy anything new craft wise)........love how this card turned out. This week looking forward to recent my purchase from Create n Craft.........a grand calibur. This will replace my rather tatty well used Cuttlebug, its quite small cant wait to be able to emboss large pieces for my cards. 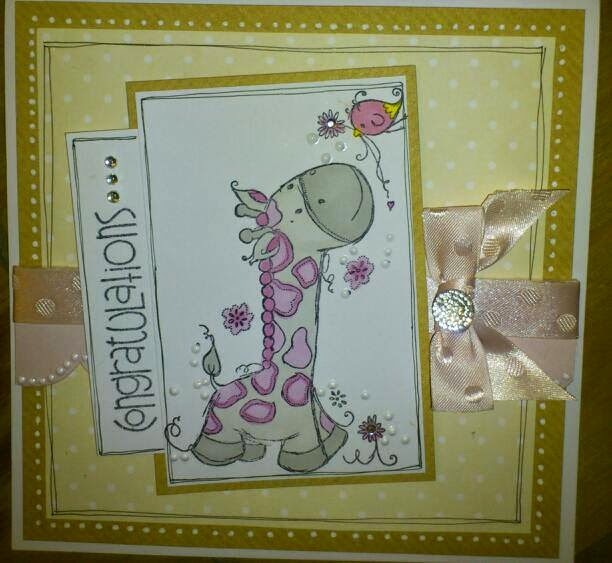 I love this giraffe stamp from Crafter's Companion.....designed by Rachelle Ann Miller.The sentiment stamp is from paper smooches my new find, loving their stamps, may have to purchase a few more. 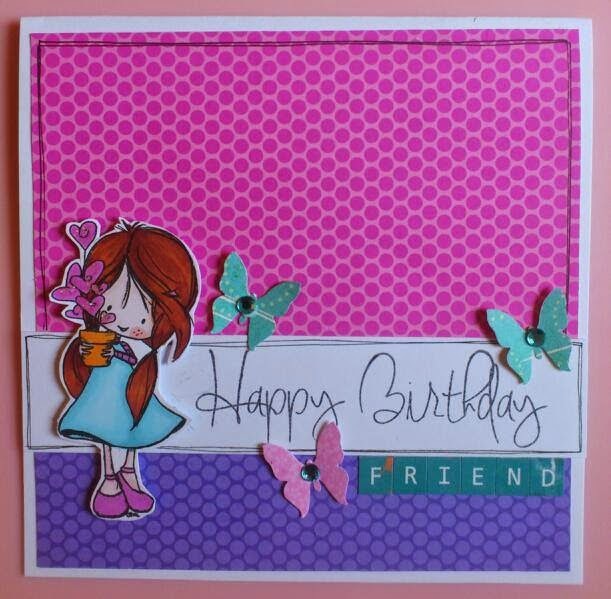 I have created a few cards with this stamp, will upload later in the week. I might have a bit more time to craft this week as I have a poorly toe and need to rest it as it very sore n bruised. 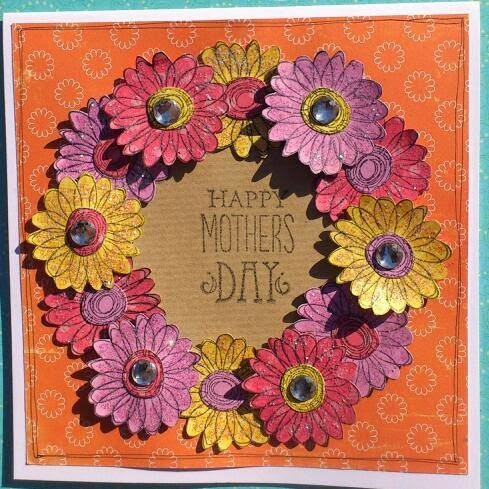 Wishing All you Yummy Mummys A very Happy Mother's Day. Bill Gates has learned nothing from his many education failures.